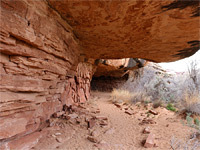 Although short, at just 0.6 miles (loop), the Cave Spring Trail is a varied hike, passing a spring, some well preserved pictographs and a late 19th century cowboy camp complete with many original artifacts, all located in alcoves below the overhanging cliffs of a low mesa. 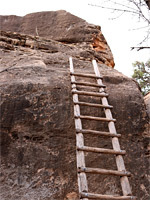 The path later climbs to the top via a pair of wooden ladders and crosses a minor summit that affords an uninterrupted, 360 degree panorama of the Needles District, before returning via a short ravine. 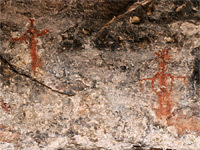 Both the pictographs and the camp are here because of the spring, a small but semi-permanent water source. The rock art is from the Fremont Culture, around 1000 AD, while the camp is believed to have been established in 1890s in the early days of the Indian Creek Cattle Company, which is still in operation though their lands are now owned by the Nature Conservancy. 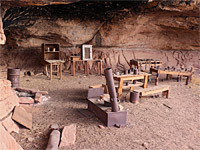 The camp was used until the 1960s, up to the creation of the national park. Top of the plateau. Full screen version (15 mb). 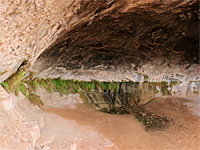 The Cave Spring Trail is overlooked by many Needles visitors, since it is not signposted from the main road, reached instead via a (paved) side road, which amongst other places accesses the ranger residential area, and then a one mile gravel track. Another, gated track forks south just before the trailhead, following Salt Creek for several miles; a permit is required for entry. The 0.6 mile loop is generally easy and is marked by notices describing the history of this location, and also identifying some of the plants, which include skunkbush, rabbitbrush, four-wing saltbush, sagebrush, gambel oak and hackberry, most of which look rather similar when not in flower. 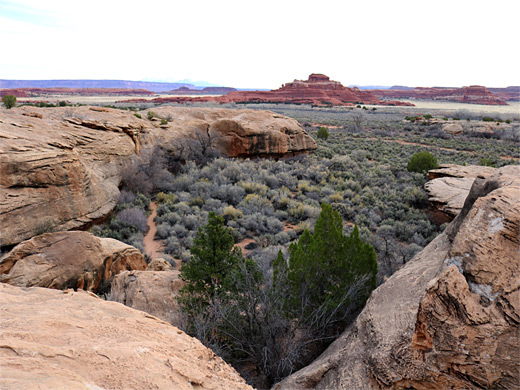 Clockwise is the suggested direction, and the trail first passes the cowboy camp, situated in a big, southeast-facing alcove, containing various wood, metal and leather relics, loosely protected by a low fence. 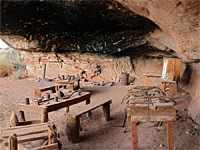 Just beyond, round a corner, is an old wooden chest, followed by the spring, in another alcove, the walls of which are adorned with a small number of red pictographs and around 40 handprints, in red, orange and gold, well-preserved on account of the overhanging rocks, never being subjected to sun or rainfall. 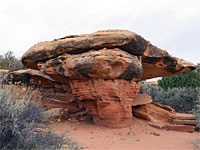 The path then ascends a two-stage cliff via one long and one short ladder, and crosses white/red slickrock on top of the mesa, the route marked by cairns. It turns briefly north then back south, descending into a ravine, later running along an extended overhang and through a patch of bushes, back to the parking area.